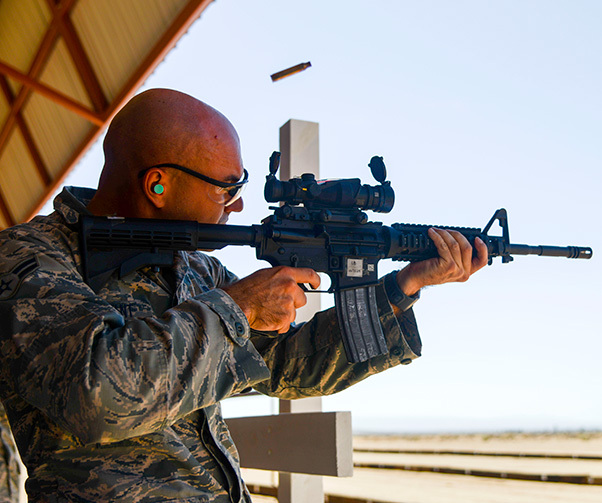 An Airman shoots at a target with an M4 carbine following a ribbon-cutting ceremony of the Small Arms Range on Edwards Air Force Base, Calif., Sept. 6, 2018. Edwards Airmen christened the new base Small Arms Range the best way they know how, by shooting at it. 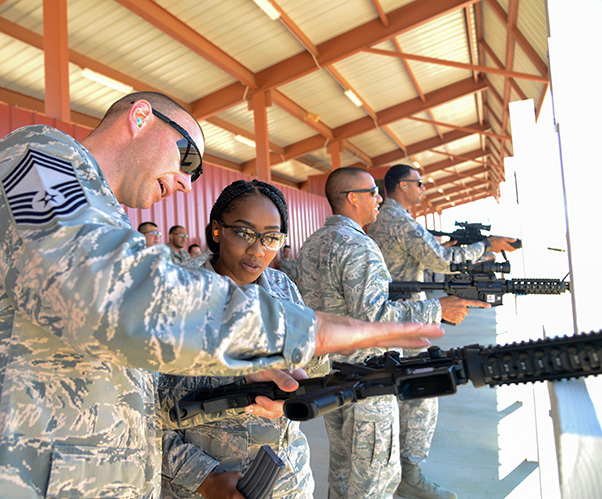 The Small Arms Range at Edwards Air Force Base, Calif., was officially re-opened with a ribbon “shooting” ceremony, Sept. 6, 2018. 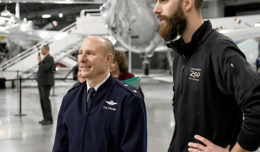 The project to renovate the Small Arms Range was originally discussed 2016 when base leadership recognized the need to update the facility, said Robert Lynch, SABER chief, 412th Civil Engineer Group. The project took nine months to complete at a cost of more than $670,000. To Lynch, the word “renovation” is an understatement. One of the major improvements of the redesigned range is the expansion of firing points. The range now has 40 firing points, up from 20. This will allow leaders to be able to have more Airmen on the firing line at one time. 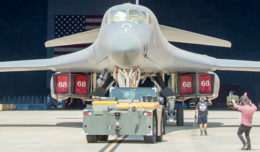 The increase in capability will allow the range to train more Airmen, and other sister services, per year, said Maj. Gilbert Wyche, 412th Security Forces Squadron commander. Airmen cut the ribbon by shooting at it during a ribbon-cutting ceremony at the newly-renovated Small Arms Range at Edwards Air Force Base, Calif., Sept. 6, 2018. 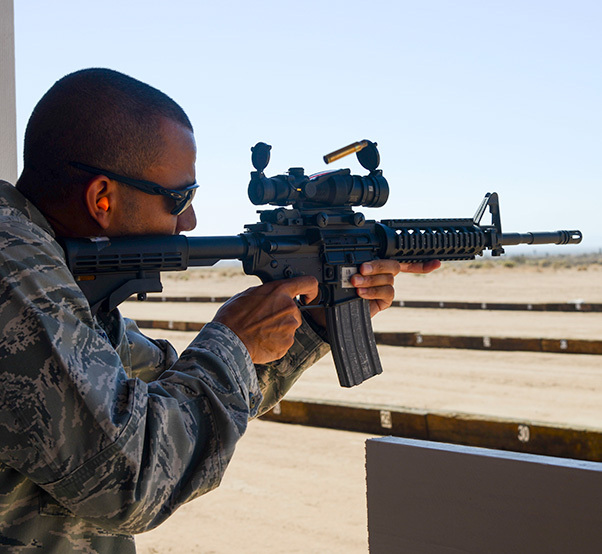 The new and improved Small Arms Range allows Airmen and other users to fire the whole gamut of U.S. military small arms weapons; the M9 and M11 pistols, M4 carbine and M870 shotgun. The range allows firers to shoot at targets up to 300 meters. “This is probably one of the only, non-training base, that has a full distance range that we can use,” Wyche said. Another major addition is that the firing lines are now covered. The construction includes space for Airmen to conduct weapons maintenance, Lynch said. The facility was designed with flexibility and cost-saving measures in mind. The space allocated for maintenance was designed to be fully enclosed, if the need arises, Lynch added. 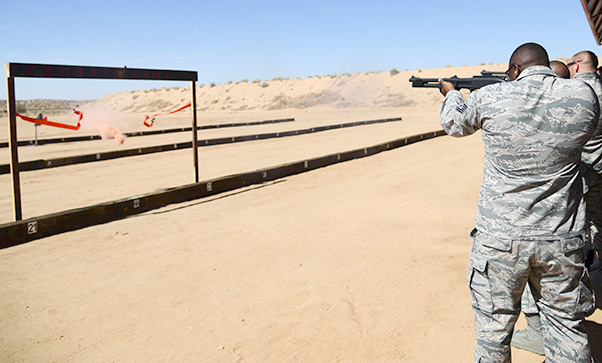 The Small Arms Range meets current and future requirements to train not just battlefield Airmen such as security forces, but all other Airmen who will be required to qualify on their weapons. 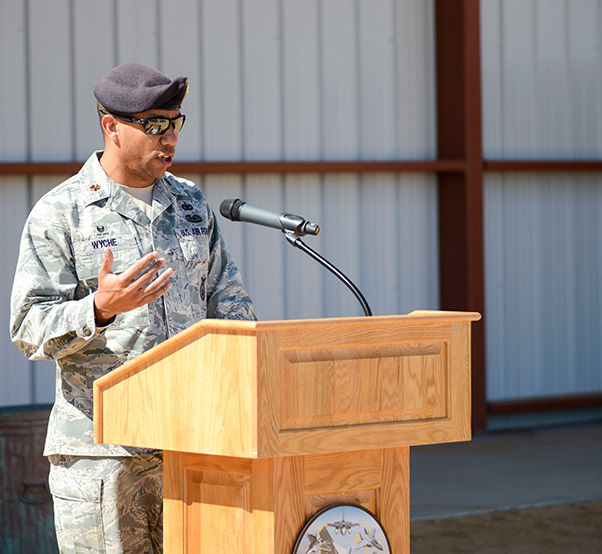 The commander of the 412th Security Forces Squadron, Maj. Gilbert Wyche, speaks about the newly-renovated Small Arms Range during a ribbon-cutting ceremony at Edwards Air Force Base, Calif., Sept. 6, 2018. Chief Master Sgt. Garrett Langston, 412th Security Forces Squadron, explains basic operation of an M4 carbine to an Airman following a ribbon-cutting ceremony of the Small Arms Range on Edwards Air Force Base, Calif., Sept. 6, 2018.